“When we set children against one another in contests- from spelling bees to awards assemblies to science “fairs” (that are really contests), from dodge ball to honor rolls to prizes for the best painting or the most books read- we teach them to confuse excellence with winning, as if the only way to do something well is to outdo others. We encourage them to measure their own value in terms of how many people they’ve beaten, which is not exactly a path to mental health. We invite them to see their peers not as potential friends or collaborators but as obstacles to their own success…Finally, we lead children to regard whatever they’re doing as a means to an end: The point isn’t to paint or read or design a science experiment, but to win. The act of painting, reading, or designing is thereby devalued in the child’s mind.” – Alfie Kohn. I saw this quote shared on facebook recently and nodded along. I love Alfie Kohn and reading one of his books a while ago changed my mind on a lot of things. As I read the comments on facebook though, I was reminded that not everyone feels the same way. People seemed to find it particularly hard to hear that competition might not be good for children. They argued that competition is a good life lesson, it motivates children, it’s an incentive to improve, and it builds self esteem. Alfie Kohn wasn’t just making these things up when he wrote the above quote. His views are backed by lots of research. No, competition is not great for children and it certainly does nothing to foster self esteem. It’s easy to see why it’s so hard for people to believe though. Just look around. There are products and programs and toys and even infant formula to give your child a ‘head start’. We all want our children to be ‘ahead’ and definitely never ‘behind’. We are so afraid of them falling behind! People invest so much in trying to give their children the ‘best start’ that maybe it is confronting to think that it really doesn’t matter, and that this kind of competition and wanting to be ‘ahead’ of peers is not actually a good thing. I do think it is something that we need to be mindful of though. I would much rather my children be intrinsically motivated and not have their self esteem built on outperforming others. If your child goes to mainstream school then it may be harder to avoid competition. These days school is becoming more about standardized testing and outperforming peers. However, you can still do your best not to bring this into the home. 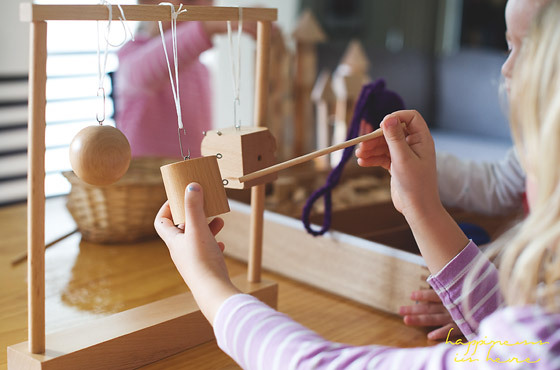 Home educating parents have the luxury of being able to tailor their children’s education to their particular needs. They can learn at their own pace, whether that’s faster or slower than the school curriculum. Yet, it is still easy to get caught up in the competition. People want to know how your kids are going? Are they up to date? Even better, are they ahead? Or you may compare yourself to others thinking that what you’re doing is not enough or your child should be more advanced by now. It’s easy to get caught up in trying to prove that home educating works by showing people how well your kids are doing compared to schooled kids. That somehow by showing your kids are ahead it makes what you’re doing seem more valid. But I think we need to ask ourselves, ahead of who? In what areas? And is that even the point? For me, the point is not to be better than anyone else. The point is to allow my children to be the best that they can be. To reach their full potential, to forge their own path, to develop at their own pace, to be happy and content, and to have freedom and childhood. And so, their progress in relation to other children is therefore meaningless. Learning and life are individual. You can’t compare or standardize them. You can try of course, as many do, but I don’t believe it is in their best interests. What if your child is interested in learning about the classification of animals? 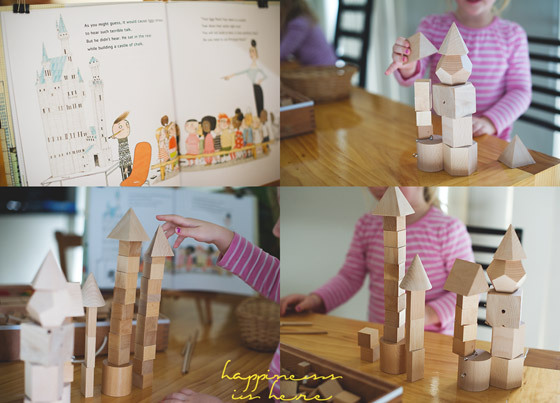 What if they want to build with blocks all day? What if they spend most of their time playing outside? Is one more successful than the other? 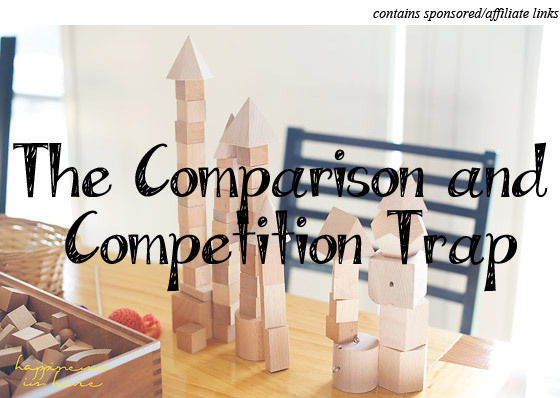 So, I’m not falling into the comparison and competition trap. That may be what happens in a school setting but we’ve chosen a different path. There is no need to judge our success against that of a system we don’t belong to, it only holds us back. There is no ‘ahead’ or ‘behind’ in life. My children may be learning things that seem way beyond their level according to their age. That doesn’t make them any better than another child. Maybe they’re not interested in reading until much later than they would in school? That doesn’t make them any less successful. What makes homeschooling successful has nothing to do with how it compares to school. What makes it successful is that children are allowed to be themselves, develop at their own pace, and take charge of their own lives. Don’t fall into the comparison trap. 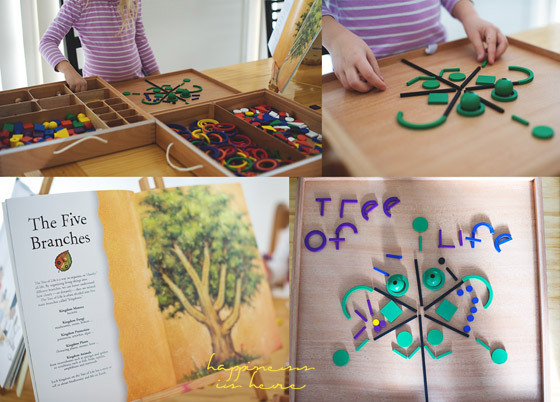 In the above pictures the girls are using the ‘Tree of Life‘ and ‘Iggy Peck Architect‘ books to inspire their work. They are both creating with our Spielgaben set. Spielgaben version 4 retails at US $449.50. You can own this new version at 11% off as a Happiness is here reader! All you need to do to claim your discount is send an email to info@spielgaben.com mentioning Happiness is here and you will be provided with a discount coupon! its unfortunate in life we have to deal with these comparisons. Its been tattooed in our brains that competition with others is the only success you will have in life. Even as an adult. I so agree. It’s something you definitely can minimise and it’s in the best interest of everyone to do so. I think for working class or lower class parents (or even single parents, sometimes) part of the anxiety that a child is not performing as well as his/her peers might stem from worries about their children having the same kind of life that they did. I mean, I’m not saying that it’s *bad* to be working class or lower class – definitely not! But rather, I think it’s sort of ingrained in parents to want more for their kids, and give them a “better life” so to speak…and when you don’t have much money to go around, the vision of a better education = more money = equals a better life. Having said that, I do agree with you, especially with this: “I would much rather my children be intrinsically motivated and not have their self esteem built on outperforming others.” Yes, yes, yes. I’d much rather have a creative, resilient, confident child than a child who is just bent on outperforming everyone! PS. Thanks for taking the time to always answer questions on here – I appreciate it. I always enjoy your posts. Thank you. You have perfectly described what my five kids have gained by being attending a Montessori school. Intrinsic motivation, they are the best version of themselves and authentic self esteem. My husband and I have spend a lot of time talking about avoiding this in our family as much as possible. Especially with a largish family of varying ages. It’s important to us that the older children understand how to nurture the younger children and to give them space to learn and grow (as we do as parents for all our children). This is a beautifully thought out post and I’m interested in reading more from Alfie Kohn. It’s good to think about these things. I remember the thrill of competition in school, at school sports days but also in smaller competitions in class. We have been dealing with competition and comparison at home and it’s really hard for my 4 year old not to do many of the things his big brother can. 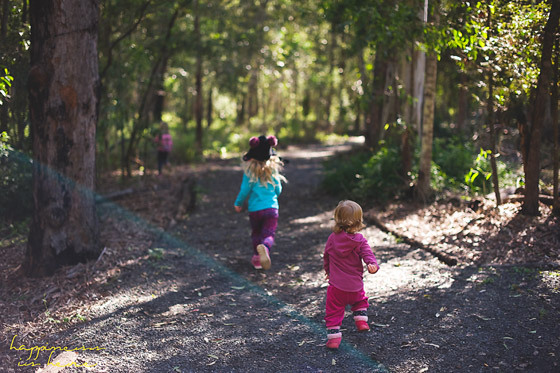 It’s really hard for kids not to compare to each other… but as parents I think we can do things to try to minimise competition between them (which is different for same aged kids than different aged kids, of course). Thanks for the thoughtful post. It’s hard for the younger ones trying to keep up with the older ones sometimes! I LOVE what you wrote. This is by far the best article I’ve read all week. For a long time, I have been wanting to get a copy of Punished by Rewards and now, I’m really going to buy one already! I am a homeschooling mom from the Philippines and I am so grateful for parents like you who write encouraging articles like this. It gives us courage, inspiration, and validation. Thank you so much! God bless you always! Continue to inspire us with your words. Pingback: What Is Respectful Parenting?